New South Wales Premier Gladys Berejiklian personally called Sydney Archbishop Anthony Fisher OP to allay fears that the state would block a $4.5 billion federal funding deal for schools. Source: Sydney Morning Herald. 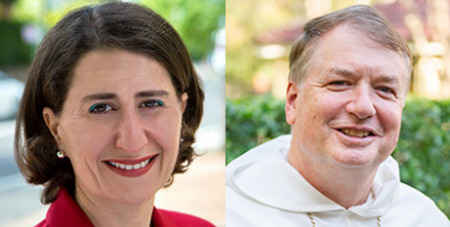 Ms Berejiklian last week made the call to Archbishop Fisher while he was in Rome for the Synod of Bishops, as Catholic Schools NSW warn of a “catastrophic outcome” if their schools miss out or have to wait for federal funding. The new funds will be phased in over a decade and be distributed on the basis of the socio-economic status of each school. The Premier’s intervention comes as Catholic schools threaten to make funding a state election issue after Education Minister Rob Stokes said he would not sign a deal that “played favourites”. The Morrison Government reignited the funding wars last month when it announced a $4.6 billion funding package for the non-government sector to ease its transition to a formula that would distribute money according to need. Ms Berejiklian has publicly backed Mr Stokes, saying his determination not to sign anything that fails to treat schools fairly was “completely consistent with the government’s position”. But Catholic Schools NSW is lobbying the government backbench over the funding deal, and has written to all Coalition MPs, warning them that Mr Stokes’ position would hurt their schools. “Why is the NSW Minister for Education risking the future of NSW Catholic schools?” the letter says. The Premier’s office would not comment on the phone call to the Archbishop. But Mr Stokes said he was confident the state and federal governments would “come to an agreement soon”.